Incoming Justice Minister aims to conserve the status of the Supreme Court - as long as it does not detract from other branches. Justice Ministry officials, led by the ministry's director general Ami Palmor, Attorney General Yehuda Weinstein and State Prosecutor Shai Nitzan participated Sunday at the welcoming reception for newly-appointed Justice Minister MK Ayelet Shaked (Jewish Home). "With reverence and great emotion, today I begin the role of Justice Minister, who is responsible for the legal system, and ensuring that these values ​​of law, truth and peace are the guiding light," Shaked said. "The judiciary is one of the most prominent symbols of democracy," she continued. "The Supreme Court, who heads this system, always was and still is a national pride, because of the protection of human rights and fundamental values ​​of the State of Israel." Shaked then promised to work for the preservation of the status of the Supreme Court. "Our Supreme Court has bought us a place of honor in the legal arena, both locally and internationally," she said. "I will work for conservation status, with the rule of law in front of me. " "The judiciary is the foundation of our existence as a democratic society. I believe it with all my heart," she added. Shaked then noted that she would try to balance out the balance of powers, however, and ensure the court "does not erode the powers of the legality of the legislative and the executive branches." 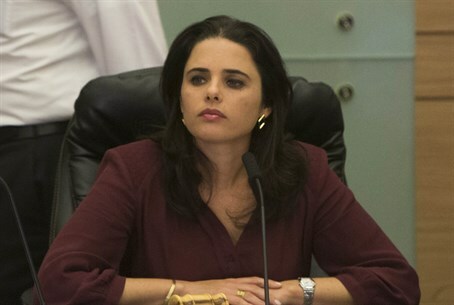 "It is no secret that as the representative of the public, I would like to reinforce the status of elected representatives in the legislative branch and the executive branch, to strengthen the sovereignty of the Israeli Knesset and the Israeli government, all while remaining committed to conserving the role of the judiciary and its status," she noted. "The recognition of the importance of the principle of separation of powers is not the lot of a specific sector, and not associated with one side of the political spectrum," Shaked insisted. "Maintaining clear boundaries is a common interest of all those who believe in the principles of democracy, regardless of Right and Left." The minister noted towards the end that the ceremony was also being held on Jerusalem Day, and that it is symbolic of the message of unity she carries. "We cannot ignore the symbolism of my entrance to the Ministry of Justice on 28 Iyar, when the city was liberated and Jerusalem was united," she said. "48 years ago today, paratroopers were on this street, in Jerusalem, in the Old City, on the way to its liberation." "I believe that this day we should focus on the idea of ​​unity - our capital Jerusalem is a national one, belonging to all denominations and to all groups," she concluded. "This day is an opportunity for us to unite and to bridge the gaps we have built."